Location: Mark Cross, East Sussex. 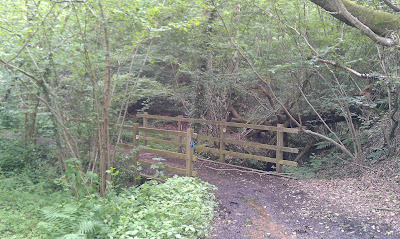 Starting GPS Co-ordinates: N51 06' 60" E000 24' 30"
Finishing GPS Co-ordinates: N51 07' 20" E000 25' 40"
This decent byway is a question of viability, to be honest, due to the provision of a wooden bridge over a ravine at around the halfway point and the fact that the land owner seems to not like 4x4 drivers. Starting out at its western end from a country road called Brickyard Lane, the lane drops downhill initially and this end is guarded by a railway sleeper cut in half and installed vertically on each side of the lane's entrance to restrict the width, put there because of persistent fly tipping by the filth of the human race. The surface consists of hard, compacted earth that becomes relatively slippery when wet (apparently a number of 4x4 drivers have had to be recovered when the going was wet!) and foliage either side of the lane is kept well maintained. 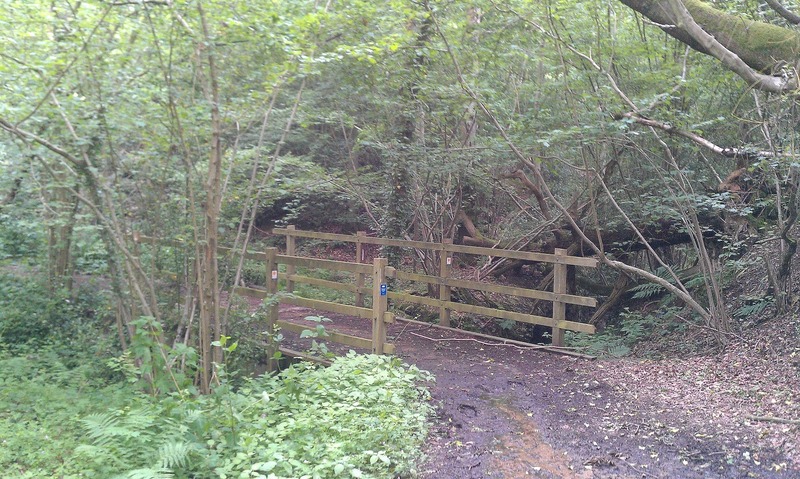 At the bottom of the hill, just before reaching the half-way point, the council have provided a wooden bridge across a ravine, which is marked on the OS map as a footbridge. This bridge looks fairly sturdy but as to whether it was designed to take the weight of a Defender 110' I cannot say, and to come clean I didn't want to be the guy to prove it can be done, so I did not cross it. If you're not as much of a wuss as I was then the byway then starts out uphill towards Green Hedges Farm and nursery where the surface soon changes to that of a driveway. The lane then ends on a country road with the very ancient title of 'Danegate', just to the north of the village of Mark Cross. I am pathetic, yes, but it looks pretty thin! Now for the landowner. I shall be fair to the guy, from what he was saying he has an actual nightmare with both the vile fly tippers from nearby Crowborough and the volume of greenlaners using the lane thereby rending the surface impassable when he moves his cattle from one field to the next. He had the greenlane resurfaced at his own expense because of it. Understandably he's not entirely predisposed towards greenlaners, and although we do indeed have every right to be there on this BOAT perhaps those of us that are conscientious enough may take a rain check on this lane in order to make life easier for him. It is after all by no means the best lane in this area, so would we be really missing out on so much by passing by? Nobody can criticise you for driving this lane, and indeed you are not doing anything wrong, but it wouldn't hurt our reputation to consider the pros and cons of doing so. 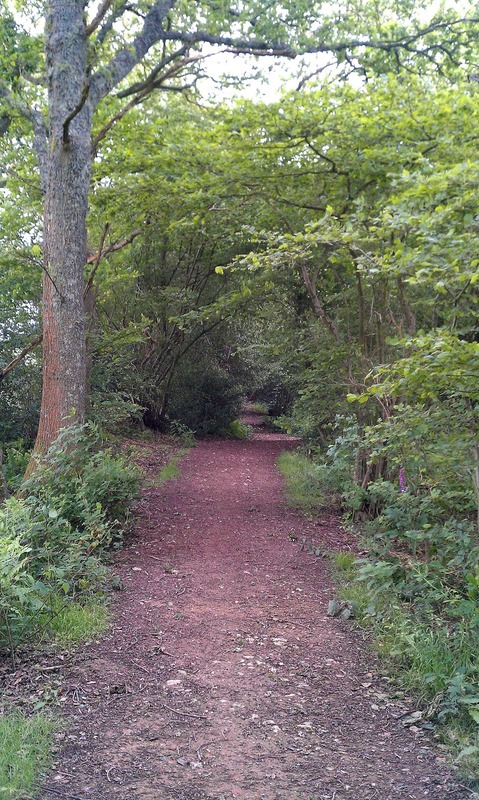 For those with an interest in history, the neolithic/Bronze Age hillfort on top of Saxonbury Hill lies just to the north of the western end of this lane, but there is not a huge amount to see these days other than the much later folly that was built on top.